Used oil barrels only upsurge landfills, after serving their purpose in industries. With increasing metal scrap, even environmental hazards are rising day-by-day. Although industries don’t indulge in the recycling of retired oil drums because of its very less scrap value, these can be transformed into something that serves various functions in your home or office. 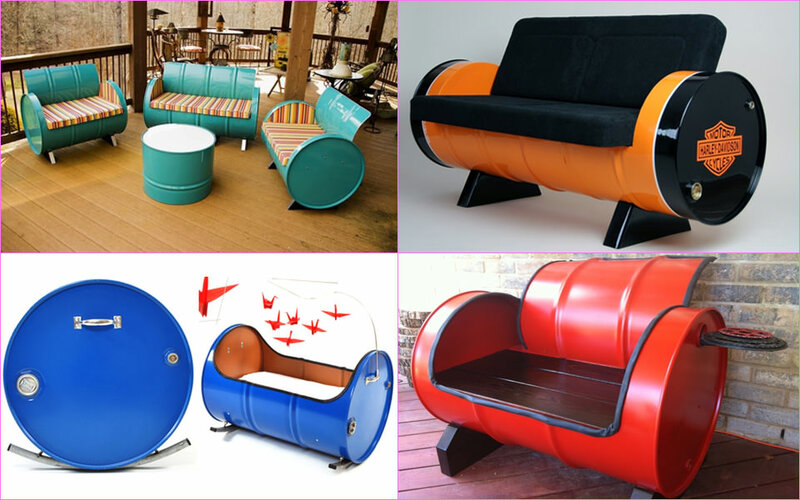 Oil drum furniture is eco-friendly in nature and practical in approach. 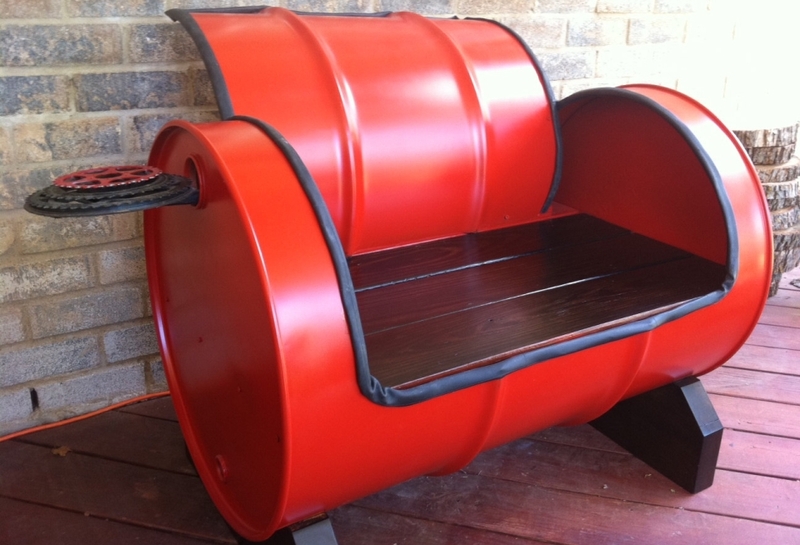 Such old oil barrels can be upcycled to build attractive yet practical furniture pieces, giving an industrial makeover to your living space. Here are 12 clever ways how retired steel drums can be converted into eco-friendly furniture for daily use. Here is an eye-catching collection of green furniture by Drum Works Furniture. The firm has brilliantly crafted recycled 55-gallon steel drums into practical living room furniture. The collection includes couches, center tables and storage cabinets. Designed by Deutschland-based Kozma Design Company, the vintage-style sofa is created by joining two oil drums and shaping them into elegant living room couch. 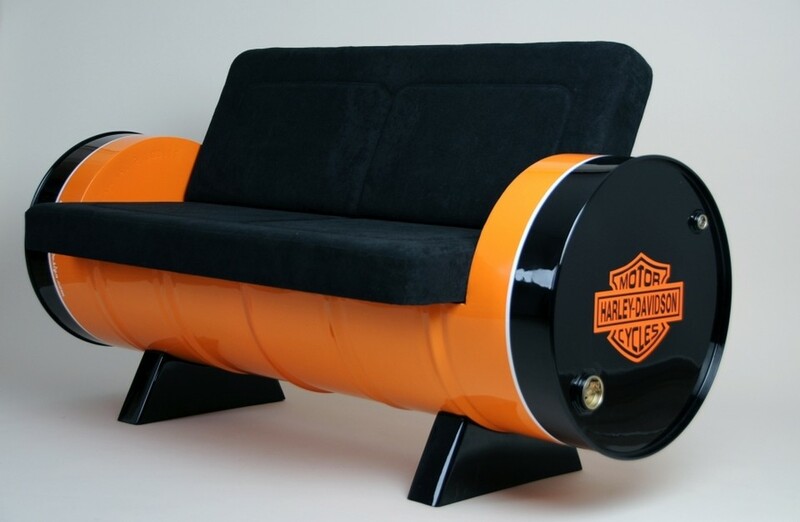 The highlighting feature of this sofa is striking Harley-Davidson logo on either side. French designers Anne and Philippe Guilbaud from Dentelles & Bidons design studio have turned metal barrels into illuminating furniture units and lanterns. Each furniture and lighting fixture from this collection boasts unique floral patterns, which is perfect for decorating any outdoor space. 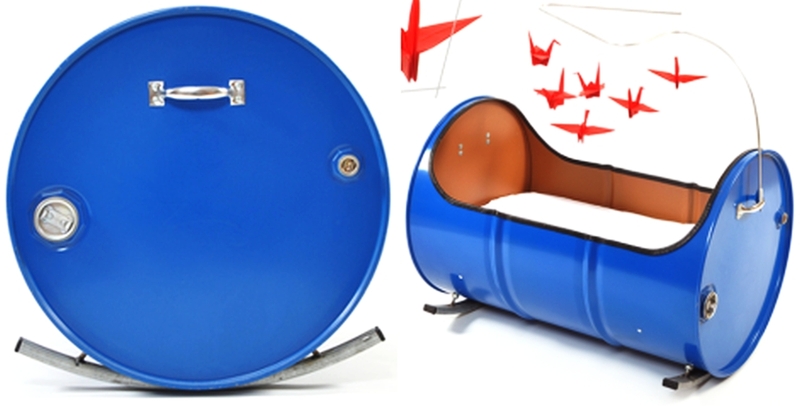 Phil Davidson, the Belfast-based designer from The Urbanite Home, has given a bold makeover to tedious oil drums. 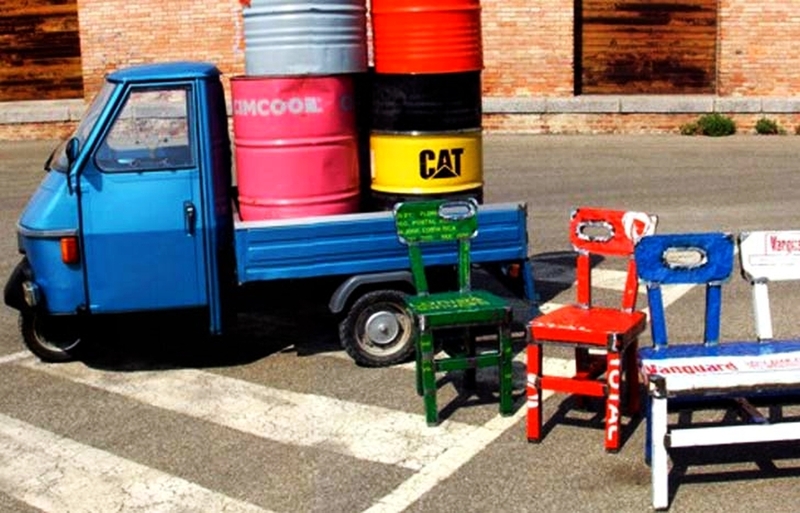 He has converted used metal drums into brightly colorful oil drum furniture pieces, which can add life to any dull room. Another beautiful example of bold seating unit is the ‘two custom benches’ by ReGEARED Etsy Shop. It is made out of a 50-gallon drum, wooden seat, upcycled gears, and reclaimed bike tubes; all giving outstanding layout to the custom furniture piece. Want to give an industrial makeover to your home? Well, these chic furniture pieces made out of upcycled rustic oil barrels are the best solution. The collection includes storage cabinet, couches, table, and lamps. German design studio Lockengeloet has also given a bright and attractive look to oil barrels by turning them into a functional orange-colored cabinet that can store your stuff while adding attractive charm into your living space. Apart from that, the firm has also turned old vinyl records into elegant coat racks. 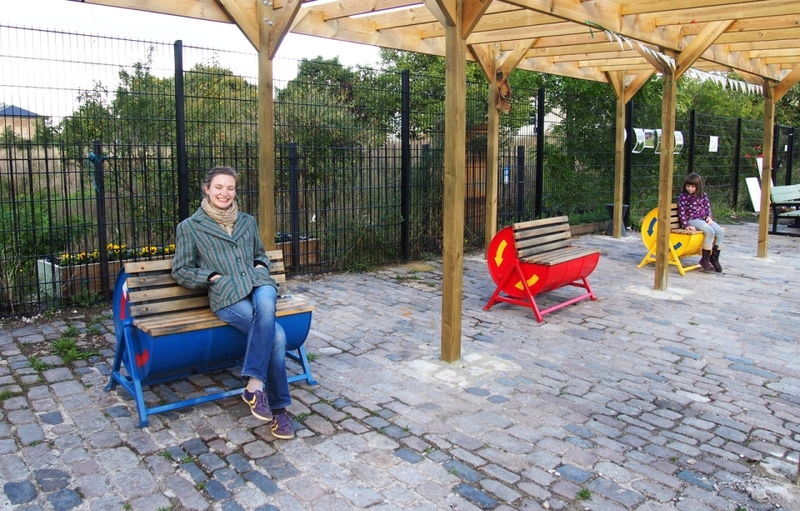 Burgess Food Project has created stunning drum benches to be installed at London Pleasure gardens as part of the London Festival of Architecture 2012. The entire body of these benches is made from metal drums, whereas the seating area is formed out of wooden planks. Give your newborn unique comfort of this offbeat barrel crib. Designed by Illinois-based design studio Junktion, the blue crib is made out of the metal barrel, metal legs, plywood and crane origami (as hanging toys). 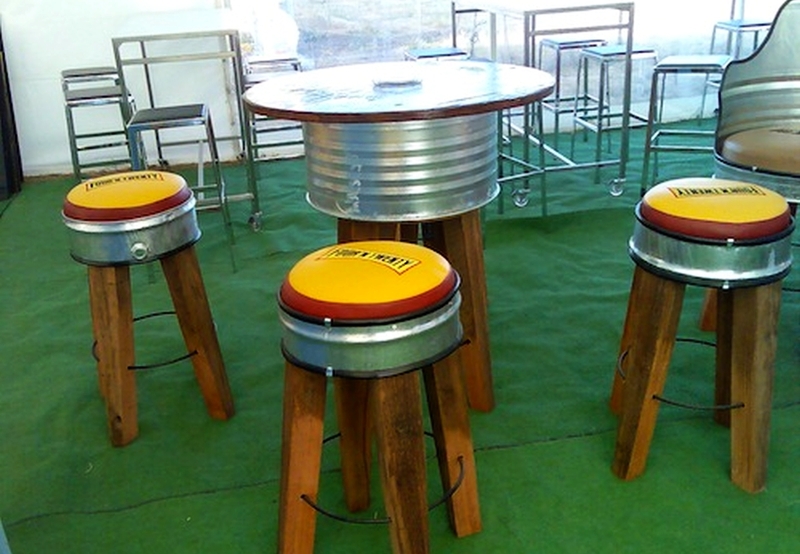 Aussie Drum Furniture has created a complete cafe bar stool set using recycled oil drums. The top surface of each stool and table is made from stainless steel body of drums, whereas the base is made out of solid wood. This unique set will give a chic industrial look to your home bar. Italian firm Vibrazioni has created the line of chairs, stools, tables, and lamps; all made from discarded industrial barrels. The rustic appearance of rugged barrels is maintained to give a robust appearance to any place where they’re kept. Anita Collection has featured rustic indoor and outdoor furniture collection, which is made entirely of out retired petroleum barrels. 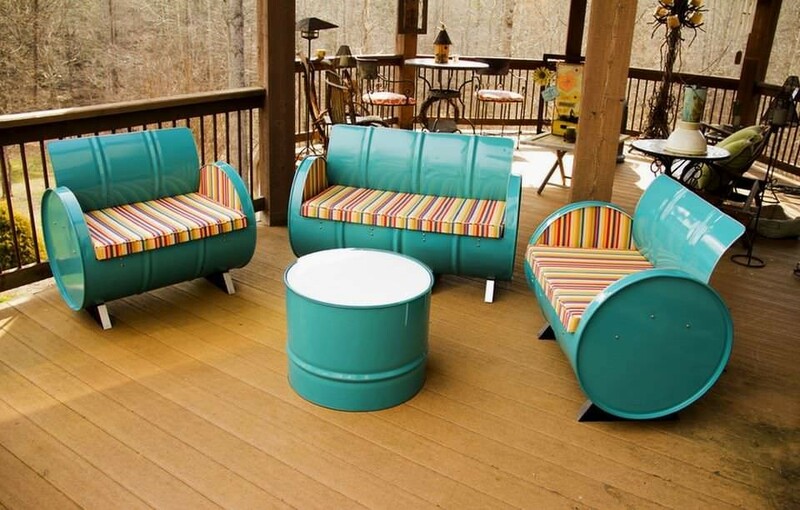 To maintain their originality, flashy paint colors are not used on these oil drum furniture units. Furniture units made out of robust, reclaimed oil barrels are not only durable and long-lasting but also great for adding an industrial element to your interior. Next time you come across any unwanted oil drum, you know how to make the most of it.